Four weeks after the tragic death of beloved teacher and community member Colleen Ritzer, Andover High School has decided to take action to show school-wide respect. 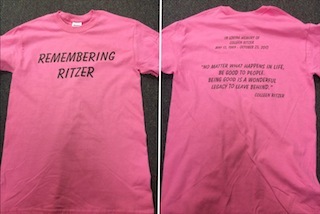 Students from Ms. Robb’s Democracy and Media Literacy class and Mr. Brennan’s TV Production class will be set up at the kiosk during all four lunches through Tuesday, Nov. 26, to sell pink t-shirts with the words “Remembering Ritzer” on the front. Pink was Ritzer’s favorite color. The back of the t-shirts feature Ritzer’s favorite quote, “No matter what happens in life, be good to people. Being good is a wonderful legacy to leave behind.” Above the quote are displayed the dates of Ritzer’s life: Jan. 1, 1989 to Oct. 23, 2013. The t-shirts are being sold for $10 each, and all proceeds will go to the Colleen Ritzer Scholarship Fund. T-shirts will also be available to the general public of Andover. The town of Danvers and Danvers High School, where Ritzer taught math, are running their own T-shirt/fundraiser for Ritzer. Robb believes that the T-shirts will bring some people in the community together but will still be hard to process for others, since many people are unsure how to feel about the tragedy. Before the T-shirts were made, several students and teachers took up the old “cup” tradition by placing red cups on the fence of the newly renovated AHS tennis courts. The message reads, “C.O.R,” Ritzer’s initials, and features a heart symbol next to it.